Since the launch of our first company-owned iOS application, PalettePro, ?at the end of May, it has been a bit of a learning experience about marketing my first application and every bit of publicity helps and is appreciated. I was pleased to see the write-up about PalettePro on the AppDictions web site. ? The concept of this tool is simple?the best ones usually are. Sometimes people spot a color that they would have for a project or practical purposes. What you can do with PalettePro is take a picture with your gadget from within the application, select the color from the image and allow the app to isolate the exact hue you wanted. It couldn?t be any simpler or more straight-forward; this is a tool that even the most technologically-impaired person could get the hang of it after a few tries. The idea of PalettePro is simplicity and it pleases me it’s one thing that stood out. I recently finished up and submitted my first personal iOS application to Apple for sale in the App Store and have it approved. ?It is the first application developed for Still River Software and not specifically for one of our clients. The application is named PalettePro and is available now. The idea for PalettePro came about when I was out at dinner one evening with a friend of mine and we got to discussing a client project and app ideas. ?This idea came to the top of the list and as a way to help us match colors for client web sites to their logo, office colors or whatever colors were important to them. ? I decided I would work on the application as time permitted and come up with something I wanted to use and if others could find value, then great. The purpose of the tool is simple; use the camera on the iPhone or iPad to look at an object and sample the color in order to be used in web applications. ? I have to first say that I am not a designer but I appreciate simple tools that do a single job and do it well. ?This was my goal for the first iteration of this application; keep it simple. The user experience is to be straightforward, just point the device at an object, tap the screen or button and see color values. ?I also wanted to be able to save the results for later viewing. You should notice when looking at the application that it’s simple and does one thing well. Using PalettePro is easy and just like taking a picture. ?When the application loads you are immediately presented with a screen similar to above, obviously with your view in the camera. 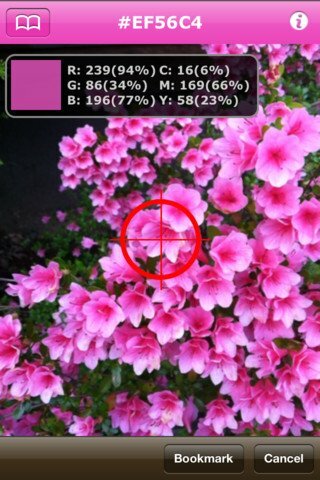 ?As you pan around your target the color values automatically change until the desired color is sampled. ?Hit the Scan button or tapping the screen freezes the color scanning and you can with save or scan again. ?Simple and straightforward. Later copy the hex values into your web application or take the device to your local paint store to match. PalettePro is available now in the Apple App Store and I would really appreciate any feedback people may have. ?The cost is $0.99 and I think well worth the cost of a cheap cup of coffee. I have already gotten feedback and suggestions for additional features which I am working on for the next point release.